There has been nothing but darkness in the land, the Bible and world history tell us that when Jesus came to our world it was a very dark time. The world was in turmoil as various conquering empires came and then they fell as they became the conquered. After the Babylonian captivity the Jews had to deal with the Persians and the Greeks and finally the Romans came along. Each of these groups brought wars to Israel, changes in their government and attempts to change their religious beliefs. The Bible tells us that at just the right time Jesus came into our world, I have to wonder if maybe part of it being the right time meant that the world was so dark that surely the people would take notice of the Light and come running to it. John 12:46 I have come as a light to shine in this dark world, so that all who put their trust in Me will no longer remain in the dark. But man has an appetite for darkness and his passions will push him further and further into the dark as he continues to look for what he is missing. We keep looking for the good life where it cannot be found. Even if we say that we hate the dark we still have a carnal desire to plunge deeper and deeper into the blackness to find our own answers. Light is a characteristic of God that the Messiah was predicted to have. (Isaiah 9:2, 49:6, 60:1) Everybody in the temple knew that Jesus was telling them that he is the Messiah, they know that the light of the Messiah is what their hopes have been longing for, but this guy doesn't look like a Messiah to them. 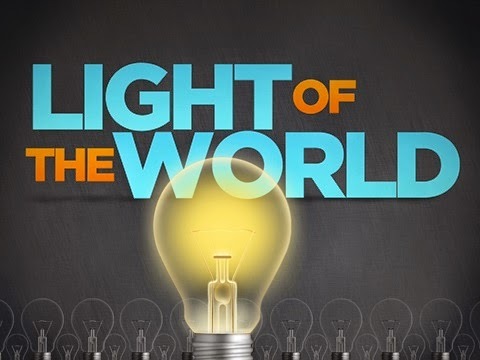 Suddenly, in this dark world where immorality, injustice, and sin is glorified, the Great Light appears and it cannot be hidden, Jesus gave light to everyone, too bad that everyone didn't welcome the light. John 3:19-21 And the judgment is based on this fact: God's light came into the world, but people loved the darkness more than the light, for their actions were evil. All who do evil hate the light and refuse to go near it for fear their sins will be exposed. But those who do what is right come to the light so others can see that they are doing what God wants. God sent light into our world because we needed the light. He gave us the sun for physical life on this planet and he gave us the Son so that we could have spiritual life.There wasn't any way that we could get out of the dark on our own, out of God's love and mercy he gave us light so that we wouldn't have to live without hope in darkness, misery and death. I need to love the Light and allow it to expose the things that God wants to change in me. I need to allow the Light to shine through me so that the world can see the truth of the gospel and have the opportunity to see their sin, choose to repent and live in the light.